Make tarot the centerpiece of your spirituality with this brilliant guide to incorporating the cards into your daily life. Tarot Inspired Life is the perfect workbook to help deepen your tarot practice, enhance your creativity, and find greater purpose each day. 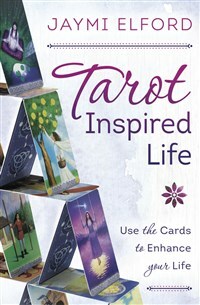 This book encourages you to befriend your deck, personalize your spreads, and create a tarot journal. It's not just filled with keywords, descriptions, or correspondences. Discover how to use the cards for creative writing, meditation, and connecting to spirit guides. Learn how your deck can be an agent of change through invocations and seasonal rituals. Jaymi Elford's guidance inspires you to think outside the norm, follow your own path, and honor your unique interpretations of tarot. Jaymi Elford is a writer, tarot coach, firespinner, and the creator of the Triple Goddess Tarot. She reads for Portlandia Fortune Tellers in Portland, Oregon, and has taught tarot classes at the Bay Area Tarot Symposium (BATS), Northwest Tarot Symposium (NWTS), PantheaCon, and at Readers Studio in New York. Jaymi currently hosts the Tarot Visions podcast and is a frequent guest on other popular tarot podcasts. She lives in Portland, Oregon.